Built in 1902, the historic Yale Steam Laundry once served the White House and Congress. But the place where clothes were cleaned, is now home to luxury condos for sale. This should be no surprise in the nation’s capital, where schools, factories, auto body shops and former liveries are all fair game. In Washington, DC, it seems as if everything eventually becomes a condominium. The Yale Street Laundry served the government and high-end DC hotels faithfully for 74 years. And in 1998 the building was recognized by being listed in the DC Inventory of Historic Sites. A decade later it became condos. But great preservationists take heart—the developers went to great lengths to preserve some of the original details—like the landmark 120-foot smokestack. Located at 437 New York Avenue NW in the Mount Vernon Triangle area, the original three-story plant went through an extensive adaptive reuse and restoration process, including the construction of a connected huge modern glass and steel structure. The redevelopment was completed in 2009. 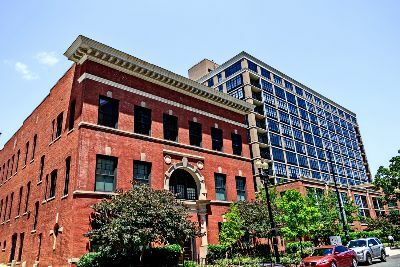 The laundry building itself became home to 16 loft-style residences, while the adjoining 12-story industrial-style tower offers an additional 133 flats. That totals out at 149 condos for sale altogether. Inside, the original building you’ll find lofts melding modern amenities with some original architectural detailing, while the flats next door sport “factory-style” windows, thus providing a flair of the original fabric. Throughout the complex, open floor plans offer hardwood floors and designer kitchens with granite counters and stainless steel appliances. This fascinating condo community also offers a twenty-four hour front desk and concierge service, parking, a fitness center, a billiards lounge and a rooftop pol with terrace. And then there’s the neighborhood itself—waking distance from the Mount Vernon Square Metro Station and the Convention Center. There’s a brand new gourmet Safeway across the street, and tons of nearby shops, bars and restaurants. Condos for sale at the Yale Steam Laundry typically list from the $300s to the $500's.